Philadelphia - On April 10, 2019 Freeman’s will offer Across Continents: Property from the Collection of Ambassador & Mrs. Alexander Weddell | The Virginia House Museum — an important selection of fine art, furniture, antiquities, decorative arts, textiles and books from the private collection of United States Ambassador Alexander Wilbourne Weddell (1876-1948) and his wife Virginia Chase Steedman Weddell (1874-1948). The Collection is deaccessioned by the Virginia House Museum in Richmond, Virginia, and the proceeds of the sale will benefit future preservation, acquisitions and care of the Museum’s Collection. From the moment they met in 1921, until their tragic deaths on January 1st, 1948, the Weddells built on an eclectic, yet cohesive collection of artifacts that reflect the extraordinary and refined civilizations they explored through their numerous travels around the globe. The collection seems particularly imbued with the Weddells’ long fascination with Central and South America, which the couple discovered during Mr. Weddell’s shifting governmental duties. A graduate of George Washington University, Weddell worked in the diplomatic corps for many years before serving as US Ambassador to Argentina from 1933 to 1939, and to Spain from 1939 to 1942. The Weddells carefully chose paintings that both complemented and challenged the Jacobean interiors of Virginia House, their home in Richmond. Among numerous European gold-ground pictures and Mexican religious scenes, stands an impressive Jacobean portrait of an English nobleman from the Clarke family and his daughter (Lot 32), as well as a rare portrait of a female courtier by German artist Franz Kessler (Lot 78), dated 1620. During their time in Central and South America, the couple acquired several fine examples of the region’s many riches. Of particular note are a 17th century painting of the Death of the Virgin from the Cuzco School that the Weddells purchased in Lima, Peru in 1937 (Lot 260), and “Le Désenchanté,” a delicate wooden sculpture by Russian artist Stephen Erzia, whom the couple met and supported in Argentina in the 1930s (Lot 253). 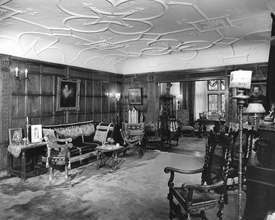 The Weddells furnished their home with taste, using period furniture and magnificent tapestries. Furniture highlights from the collection include a fine Spanish Baroque walnut and giltwood vargueño on stand (Lot 309), a rare Elizabethan marquetry oak court cupboard (Lot 24), an exceptional late Elizabethan/early Jacobean carved oak court cupboard (Lot 31), a very rare carved ivory and papier-mâché dressed statue of a Madonna retaining her original clothes (Lot 261), and a very early Nasrid-style marquetry and ivory-inlaid walnut chest, produced in Venice or Barcelona in the 15th century (Lot 149). The sale also includes a 16th century Brussels tapestry (Lot 72) and a 17th century Mortlake fragment from ‘The Horses’ series designed by Frans Cleyn (Lot 52). Also of note are a group of Himalayan bronze, copper alloy, and carved wood Buddhist works of art, collected by the Weddells on their travels in India and China. The earliest works date to the 15th century and include a fine figure of Buddha Akshobya with elaborate engraved robe (Lots 198 through 203), and two large Nepalese figures of bodhisattvas (Lots 190 and 191). Ottoman silver and tombak; Russian niello snuffboxes from the period of Catherine the Great; and English, French, American, and Mexican silver are also represented. Enamored of the erudite and genteel country life, Alexander also built a refined and extensive library of early manuscripts and reference texts in the gentlemanly tradition, mainly of travel and exploration influence, but also including first and inscribed editions from Émile Zola (Lot 480), Jonathan Swift (Lots 450, 451 & 464), Guy de Maupassant (Lot 478), Voltaire (Lot 465), Gustave Flaubert (Lot 446) and Théophile Gautier (Lot 475); and a series of Russian imperial bindings, the jewel of which is a first edition, Cologne, 1700 of Mémoires de Monsieur d’Artagnan (Lot 456). Meanwhile, Virginia enthusiastically collected a very fine collection of English and Spanish embroideries, French and Italian silks and velvets, and ecclesiastical vestments to furnish their home and upholster their antiques. The highlight of this section is a group of Spanish silk and metal thread embroidered velvets, likely convent work, from the 16th through the 18th centuries. Virginia House was presented by the Alexander and Virginia Weddell to the Virginia Historical Society in 1929. Following the Weddells’ tragic death, the Historical Society took ownership and management of the property and for seventy years, served as a faithful steward of the house and its diverse collections and gardens as outlined by the Weddells. In 2017, the Historical Society’s board of trustees approved a plan to increase the use of Virginia House with a focus on donor stewardship, public and private events, and interpretive programs. In order to best care for the site and the items bequeathed by the Weddells, the Historical Society has thoughtfully deaccessioned items that had been stored onsite for decades. The items in the present sale were deemed unrelated to the mission of the Historical Society or unnecessary for the future interpretation of the site. Proceeds from the sale will be placed in a restricted fund for the preservation of the property’s historic structures and landscape features and the acquisition and direct care of collections used to interpret the site and the Weddells.